Though its not so complex module but still would like to share with you what we have developed. As we know that from POS Back Order, we can create invoice one by one. So here we made solution where we can select more than one POS Orders and create invoice at once. In below screen, we can see that there is no invoice created for these POS Orders. We can easily filter POS Order by dates and it will display order which are not relate with any invoices. For creating invoice for POS Orders, it requires to select customer. It will take order lines of all selected POS Order and create one customer invoice in DRAFT state. 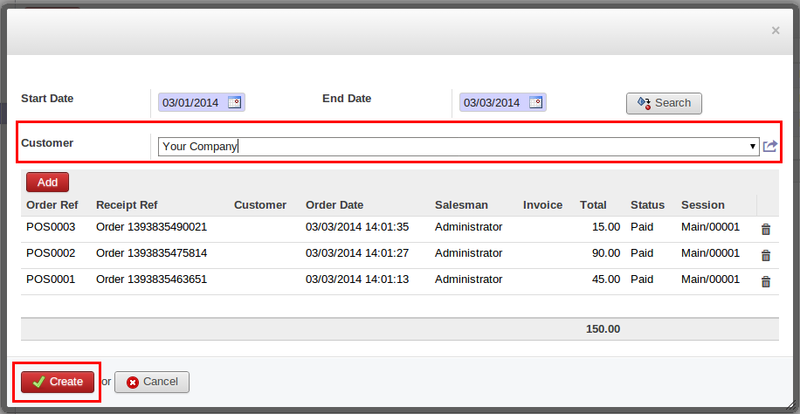 After creating invoice, all selected POS Orders “Status” and “Invoice” fields value will be change. In case of “Cancel” invoice, it will update both fields into POS Orders. But I have a question, creating a new Customer Invoice from POS Order(s), will lead to register the transaction twice in the accounting Journal Entry page, One from Customer Invoice Page & its payment and the other when validate and close the POS session. This will lead to register the sale amount twice!! How to make use of this feature without doubling the transaction? Thanks a lot for this wonderful blog. It was lot helpful in business point of sale.